Whether planting a tree to add seasonal beauty, grow backyard fruit, provide a bit of shade, or reduce energy costs, it’s a big upfront investment. Make the most of your money spent by giving your tree its best chance at survival with proper planting and care. Now is a great time to plant trees. Cooler air temperatures make it less stressful on newly planted trees and the gardeners planting them. Select a tree suited to the growing conditions. Make sure it tolerates the sunlight, soil and temperature extremes. Check the tag for the mature height and spread. You’ll have a better-looking plant that always fits the space with minimal pruning. Plant it correctly to insure your tree thrives for many years to come. Dig a saucer shaped hole three to five times wider than the root ball. It should only be as deep as the distance from the root flare to the bottom of the root ball. The root flare, where the roots bend away from the trunk, should always be at or slightly above the soil surface. Set the tree in the hole, then peel back and cut away any burlap and wire cages. These can eventually constrict root growth. Roughen the sides of the hole and backfill with the existing soil. Water thoroughly to moisten the roots and surrounding soil. Continue to water thoroughly whenever the top few inches of soil are crumbly and moist. 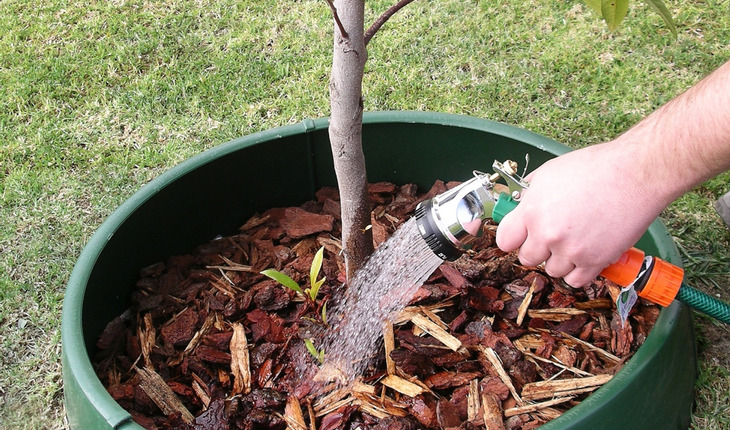 Proper watering, especially during the first two years, is critical for establishing trees. Watering thoroughly as needed encourages deep roots and a more drought tolerant and pest resistant tree. Make the job easier with a watering aid like GreenWell water saver (greenwellwatersavers.com). This contains and concentrates the water where it is needed, acting as an insurance policy for your tree during the critical root establishment phase. It also holds the mulch in place and prevents weed whips and mowers from damaging your tree. Be sure to mulch the soil surface with a two- to three-inch layer of woodchips or shredded bark to conserve water, suppress weeds and improve the soil as it decomposes. Pull the mulch back from the trunk of the tree to avoid disease problems. Remove any tags that can eventually girdle the tree and prune out any broken or rubbing branches. Wait a year to fertilize and two years, once the tree is established, for additional pruning. Continue providing tender loving care for at least the first two years. Make regular checkups, prune to create a strong structure, and keep grass, weeds and lawn care equipment away from the trunk throughout the lifetime of your tree. Your efforts will be rewarded with years of beauty, shade, and for some bushels of fresh fruit.